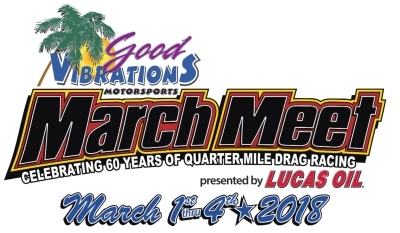 2018 saw the 60th Anniversary of the March Meet held at Famoso Raceway, where many famous racers and vehicles have taken a trip down this famous track. Attending the event were the likes of Steve Gibbs, Ed McCulloch, Roland Leong, Jeff Diehl, Robert Hight and Tom McEwen. Some of the classes the entry was slightly down due to the weather in the US, snow and rain falling in many areas of the country. 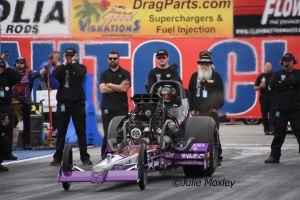 Rain on Saturday saw only a handful of cars get out onto the track, the nitro classes completed their eliminations on Sunday, but the remaining classes had to complete their eliminations on Monday. 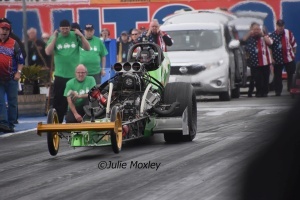 There was only one qualifying session for the twelve Top Fuel cars and Mendy Fry topped the field with 5.736-219. 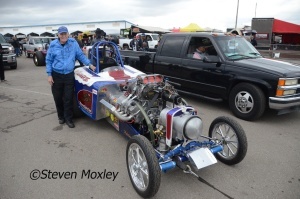 Bret Williamson was Fry nearest challenger 5.933-247.47. 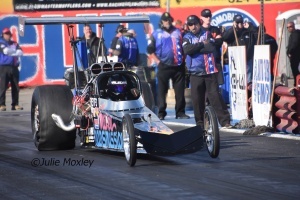 Pete Wittenberg ran 6.305 followed by Reigning Champion Jim Murphy 6.402, Rick White 6.690, Brendan Murry 6.706, Dan Horan 7.038 and Adam Sorokin on the bump spot 7.515. Fry ran top speed of the meet 261.42 when she beat Sorokin in round one and then low et 5.600 when she knocked out Murphy in the next round. On the other side of the ladder Williamson had a fire as he got to the finish line against Horan. Williamson completed the repair and faced Wittenberg who took the win light 5.833 to Williamson 5.943. The final was decided when Fry crossed the centre line and Wittenberg won the trophy. 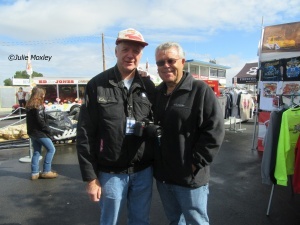 After two qualifying sessions Bobby Cottrell was the number one qualifier 5.650-259.31. Twenty six cars tried to qualify for the sixteen car eliminator. Jeff Arend was next 5.664, Mark Sanders 5.678 just edged Steven Densham 5.679 and Jason Rupert 5.688. Steve Easton Barracuda body came off the car during qualifying. Brad Thompson was on the bump spot. 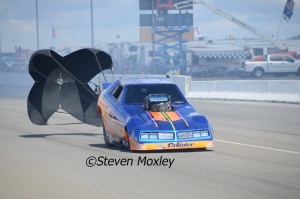 Thompson had a burst panel go when he lost to Cottrell in round one of the eliminations. 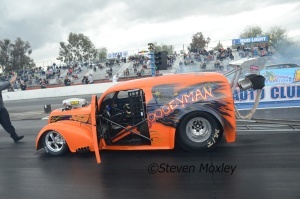 Matt Bynum ran top speed of the meet 259.61 when he lost Shawn Bowen. Both Arend and Sanders were knocked out in the first round of the eliminations. 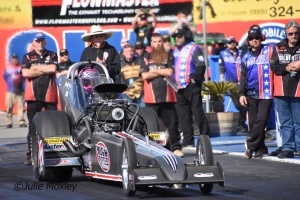 Cottrell then ran low et 5.588 to end Bowen weekend. The other side of the ladder Reigning Funny Car Champion Ryan Hodgson reached the final by beating Tim Boychuck, Paul Romine and Rian Konno. Cottrell beat Steve Densham in the semi-final. Cottrell went on to win the event. 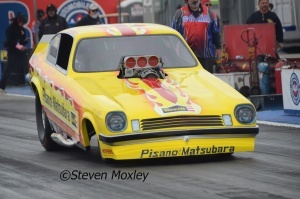 The AA/Fuel Altereds run on a 6.00 index and Dan Hix ran 6.005 on the only qualifying session the Fuel Altereds had. Fourteen cars ran in the session. 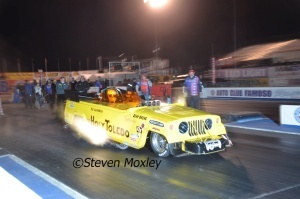 Todd Miller ran 6.194 for number two spot followed by Brian Hope in Pure Hell 6.331. Mark Whynaught was on the bump spot 8.025. 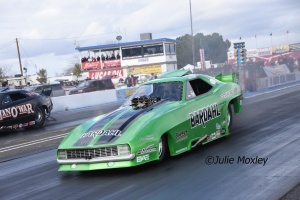 Tom Padilla was first alternate and ran top speed of 226.35. Jeremy Sullivan, Jim Holtz, Rodney Flournoy and Chris Bennett driving Leon Fritzgerald Pure Heaven 3 didn’t qualify for the show. Whynaught found a tune up and ran 6.207, but it wasn’t enough to stop Hix 6.112. Padilla came in as first alternate for Shane Harter, but them Padilla had a problem. Leaving Keith Wilson a bye run. 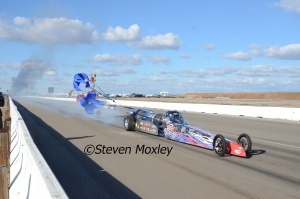 Miller dropped off his qualifying pace and Robert Winefsky took the win light 6.410 to 6.620. Hope ran a stunning 5.989 at top speed of the meet 235.43. Eric Gates took the win. Wilson and Winefsky were a no show, so it was straight into the final, Hix led from start to finish to beat Gates 6.301 to 8.914. Four cars entered and only two managed a qualifying pass. John Evans ran 6.930 and Brad Thompson ran a troubled 17.252. 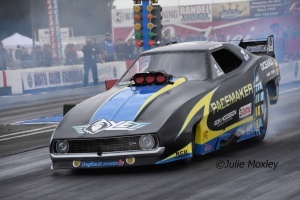 In the semi-finals Mike Halstead ran best figures of 5.546-257.14 to knock out Brad Thompson 6.417-171.19. In the other semi, Billy McDevitt had a bye against Evans. Halstead won the final when McDevitt had a troubled run. This is a new idea and is only being run at this meeting. 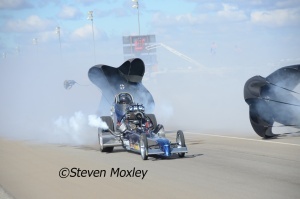 The idea is with 30 or more Funny Cars entered in the pass. This gives the slower cars a chance to race on Sunday. Claude LaVoie ran 6.521 just ahead of Shawn Van Horn 6.562. 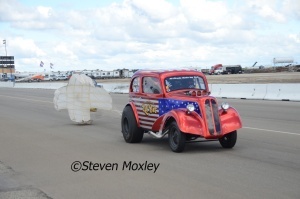 Dean Oberg was in his 67 Jeep and ran 6.601. 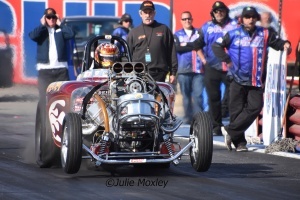 Jeff Utterback was the last racer 6.882. 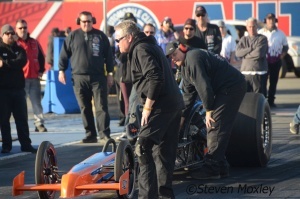 Utterback ran low et of 6.137 to reach the final against LaVoie 6.283. In the other semi, Oberg beat Horn 6.610 to 10.802. 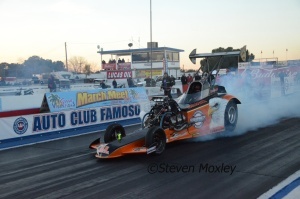 Only Oberg came to the start line for the final and launched with header flames shooting out the sides of the car. Drew Austin ran a jaw dropping 5.813 to be the number one qualifier. 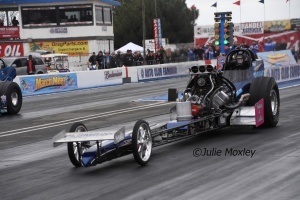 Reigning Champion Kin Bates was next 5.893-235.10, and went on to win the event 5.849 to a losing Rick Ewens 6.072. 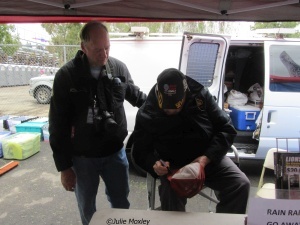 On a personal note I took my Mongoose 57 Chevy hat to Bakersfield (first time outside the UK) to get Tom McEwen to sign it, which he did and I have now decided to retire the hat after almost thirty years. It seemed a fitting way to end at the iconic Famoso track.